Maintains Low Ozone Levels During Scanning Ozone levels as low as 20 ppb have been shown to degrade signals from Cy5 and other fluorescent dyes used with samples analyzed by microarrays. The NoZone GP Workspace eliminates ozone degradation of fluorescent signals that may distort microarray data during scanning of arrays using GenePix scanners (MDS Analytical Technologies). The NoZone system features an external ozone scrubber that continuously pumps ozone-free air into a sealed acrylic enclosure surrounding the microarray scanner. 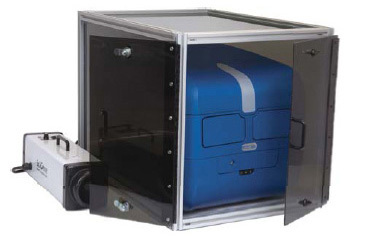 The enclosure doors swing outward to allow unimpeded access to the scanner for loading and removing samples. The NoZoneGP Workspace was developed in cooperation with Axon Instruments (now part of MDS Analyticl Technologies) the manufacturer of GenePix scanners. They recommend the NoZoneGP for use with all GenePix scanner models. The NoZone GP enclosure is designed to fit all GenePix models including the Model 4000A and B scanners and newer 4200AL model with autoloading capability. The enclosure arrives fully assembled for easy installation. Just place it over the scanner, connect the ozone scrubber and turn on the power. Within a few minutes, ozone levels inside fall and remain under 5 ppb independent of external ozone levels. Loading and unloading samples from the scanner with the door open leads to a transient increase in internal ozone levels but safe levels return within a minute after closing the enclosure doors.